Ready for IELTS. Student's Book Pack. Ready for IELTS 2nd Edition provides full preparation and practice to take the Academic IELTS module and looking to achieve an IELTS band of between 5.0 and 7.0. It is a topic-based course with a strong grammar, vocabulary and word-building syllabus throughout. The language is integrated with the exam practice in each unit, and there are clear examples of the target language in context. In addition, the language is recycled throughout the unit and the course. Welcome to Ready for IELTS, a course which is designed to help you prepare for the IELTS Academic exam. 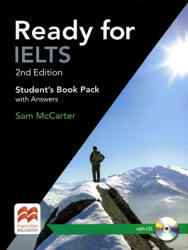 The book aims to help students progress from a global IELTS band score of 5 to a band score of 6.5/7. Students with a minimum score of 4/5 in any aspect of the exam can also use this book to help them achieve a global band score up to 6.5/7. For example, to achieve a global band score of 5 candidates need minimum scores of 4, 5, 5, 5, in any order, in the four modules of Listening, Academic Reading, Academic Writing and Speaking. For a global band score of 7 candidates need 6,1,1, 1, again in any order. The book contains a wide range of activities aimed at improving your English and developing the language and skills you need to improve your band score. As well as providing thorough practice in reading, writing, listening and speaking, each unit of Ready for IELTS includes one or more Language focus sections, which analyse the main grammar areas that are required for the exam, together with Vocabulary and Word building sections.